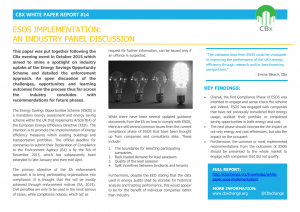 This paper was put together following the CBx evening event in October 2015 which aimed to shine a spotlight on industry uptake of the Energy Savings Opportunity Scheme. Our panel of experts discussed the implementation of ESOS, explored the ESOS process alongside the challenges and opportunities identified, and discussed the learning outcomes from the process thus far. Research was presented on energy audits in complex buildings with the challenges associated ESOS. With special thanks to our fantastic panel of experts; Keith Brierley, Senior Advisor, Environment Agency, Paula Morgenstern, PhD Candidate at UCL Energy Institute, Lindsey Malcolm, Environmental Team Leader, XCO2 Energy Ltd, and Andries Van der Walt, Associate, Head of Sustainability, Asset Services, Cushman & Wakefield.